Latent prints are chance or accidental impressions left by friction-ridge skin on a surface, regardless of whether they are visible or invisible at the time of deposition. Recognition of evidence that may contain fingerprints and the processes that can develop these latent prints is crucial in preventing valuable evidence from being left undetected. Latent Print Processing Guide goes beyond the basic police training, covering latent prints in detail and providing first responders with adequate training and guidelines. To process latent prints, examiners use various techniques including electronic, chemical, cyanoacrylate, and physical methods. 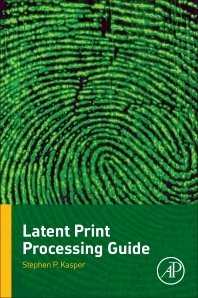 Latent Print Processing Guide offers a broad understanding of latent print detection, development, and recovery, including insights on stateof-the-art technologies. Includes history of latent print identification and some of the pioneers and their contributions. Defines the differences between chemical and physical processes and explains process sequence protocols and recovery methods for different types of evidence. Chapters include: process selection, application and recovery, special considerations for specific materials, protocol sequence and process formulas, including required materials, application method, expected results, safety measures, and references. The text is written so that non-crime scene or non-crime laboratory personnel can also gain valuable information from it. professors, students, crime lab technicians, forensic analysts, crime scene investigators, police officers, lawyers. Steve Kasper retired as a Senior Crime Laboratory Analyst - Latent Print Section, from the Florida Department of Law Enforcement, Fort Myers Regional Operations Center. Prior to that he retired at the rank of Detective from the Town of Amherst Police Department, Amherst New York where he worked in the crime lab as a latent fingerprint examiner and forensic photographer. All totaled he has 36 years experience in law enforcement with half of that dealing with crime scene investigation and fingerprint examination. While working with the Florida Department of Law Enforcement he served on the Quality Assurance Committee – Fingerprint Discipline and the Committee to revise the Latent Print Analysis Training Program and Latent Fingerprint Procedures Manual. Mr. Kasper was an Adjunct Professor at Edison College in Fort Myers Florida, teaching the Latent Fingerprint Development course from 2003 thru 2006 and was a member of their Crime Scene Technology Advisory Committee (2002 to 2007). He has had articles published in several forensic periodicals and is an Active Life Member of the International Association for Identification.